- See trailer for Angus, Thongs and Perfect Snogging, a movie guaranteed to alter the tween lexicon for at least six weeks: mutti! Vati! Snogging! Nunga-nungas! Facsimile of a fax of a scam! Saliva-ville. Hits US theatres this October. - And speaking of a whole lotta words that mean nothin', Spam makes like Weekly World News. - Plaid wraps up the weekend on the West Coast. "Wash down the bitter taste of capitalism" -- with Coke and pizza? 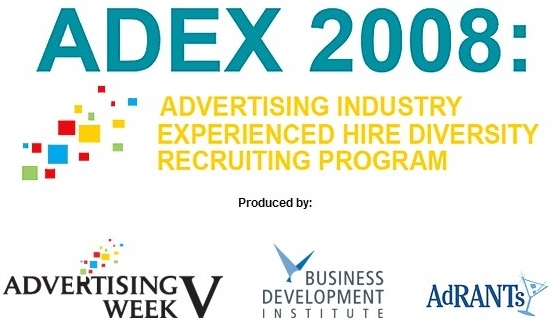 During Advertising Week, Adrants and the Business Development Institute will be hosting its second annual ADEx: The Advertising Industry Experienced Hire Diversity Recruiting Program. Yes, we know it's a mouthful but its purpose is really simple: to bring recruiters and and experience advertising professionals together. Although all, of course, are welcome to apply, our focus is on diverse candidates including those with minority backgrounds, women, and GLBT. There's lots of opportunities for job seekers as well as employers (remember how poorly you were represented a couple weeks ago. Here's a chance to rectify that a bit. Check out all the details here. Andy Sernovitz, a big advocate of word of mouth marketing and host of the Gas Pedal dinner series is hosting a "Learn Word of Mouth Marketing" crash course in Chicago July 30 and September 4. The course will cover the five steps of word of mouth marketing, how to insure ROI and how to create an actionable word of mouth marketing program for your company. There's more details here and if you use the code "weloveadrants", you'll get a nice $250 discount. I've been to his events and they are very informative. If you have any interest in WOM, it would be worth checking out these seminars. 2) boring my audience, which will consist of professional photographers. I'm clearly not one of them and I won't do justice to their angstiest stock photo/ad agency concerns, so I'll be leaving plenty of room for Audience Questions!. Read about other Shoot! the Day panels at the PhotoShelter blog. And if you'd like to come watch me make awkward jokes and commit forehead-slapping faux-pas, here's how to volunteer for a free pass. 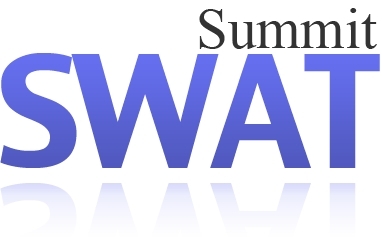 Yesterday at San Francisco's Westin St. Francis, Room Full of People held the SWAT Summit, a one day conference which covered the topic of social networking. Topics such as metrics, best practices, user engagement and social advertising were covered. After Room Full of People CEO Christian Perry gave an engaging overview of Obama's brilliant use of social media as compared to McCain's abysmal use, IDC Research Analysts Caroline Dangson gave an overview of people's outlook on social media and their willingness to allow advertisers mine personal information and online social behavior in order to provide more targeted advertising. Perhaps it was the way IDC asked the question but unsurprisingly, a very low percentage of people said they'd be OK with that. MediaSmith CEO David Smith presented for the first time his Eight Levels of User Engagement, a detailed look at the buzzword du jour "engagement." It was one of those presentation that was so elaborate and so complete that no summary would do it justice. Besides, I can't remember the half of it but don't fret. He's taking it on the road for six months and there will be a book (or a paper). Yes, it's time to pimp ad:tech. This time it's in Chicago and this time, aside from the fact there will be some decent keynotes from Google's Kevin Kells and author Clay Shirky as well as panels with Edelman President Rick Murray, Nielsen Online's Pete Blackshaw, Starcom's Chris Allen, NBC Universal's Peter Naylor and BlogHer's Jory Des Jardins among others, there will be great parties. After all, that's why you go, right? To get drunk and inappropriately fawn all over industry hotties...uh...I mean network with fellow industry colleagues. Newsflash! Adrants to Speak at Social Networking Conference! Yea, yea, yea. I can hear it now. "I need another social media conference like I need diarrhea during a new business pitch!" But this one's different. I'll be there. You'll have the perfect opportunity to hear me make a fool of myself while pretending to know what the hell social media actually is. Thankfully, there will panelists there who do know can help you make use of social media (or whatever the hell you want to call it) for the betterment of your business. More specifically, the conference will focus on the social networking aspect of social media. About as surprising as a traffic meeting on a Monday morning, Epoch Films, after talks with Cannes organizers, JCPenney and Saatchi & Saatchi, has decided to withdraw its Speed Dressing Cannes entry which was awarded a Bronze Lion. The ad, one of the best ever created for the clothing retailer since Saatchi & Saatchi won the account, was shot by Epoch films without, as all parties claim, the knowledge of JCPenney or Saatchi & Saatchi. It's not the first time a faux ad has been submitted, duped everyone and won but it has turned into one of the more high profile offenses. Not that a few won't end up atop Rock Bottom at the end of the night anyway but it's nice to know that, for the first time in, like, forever, there will be a party at the Chicago ad:tech that won't be held at Rock Bottom or Fulton's. Nope. This year, it'll all be happening at Enclave, a swanky nightclub where Kim Kardashian has been know to appear - not that that matters to anyone, of course. ad:tech has a sponsor or two for the party but companies looking to tap into the creme de la creme of online marketing would be wise to contact ad:tech to get in on the action. After all, let's be blunt, someone has to pay for all those expected free drinks. We can't have conference attendees actually paying for drinks. That, as you know, just isn't done in this business! Contact mike@ad-tech.com to get in on the action. More info on party details to follow.